Stirling, S.M. 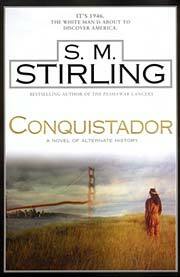 Conquistador . NAL/Roc 2003. What if: Alexander of Macedon lived until 280 BCE or Pocahontas lived until 622 CE. Summary: Involves a crosstime gate from a familiar California to world in which Eurasia is dominated by the distant remnants of the Alexandrian empire, but the Americas were never "discovered". Comments: The timeline in which Pocahontas lived until 1622 is little different from ours and its use might not be noticed for discussion in the the appendices. Published: NAL/Roc 2003 (0451459083w88 android), 2004 (0451459334w88 androidBUY). Awards: Finalist: 2003 Sidewise Award for best long-form alternate history.